The exhibition provides a beautiful and fascinating look at the diversity of ceramics made in ancient Persia (what is now present-day Iraq, Iran, and Afghanistan). Produced for both the luxury and middle-class markets, these vessels, bowls, pitchers, and bottles reflect numerous cultural and artistic influences and an aesthetic sensibility that seems startling modern. 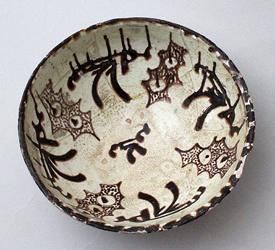 From 10th-century splashware, buffware and slip-painted ware to lusterware and 14th-century fritware, the objects illustrate the influence of Chinese porcelains, as well as typical Islamic abstraction, calligraphy, and imagery inspired by forms in nature. The works exemplify the sophistication of an urban culture that prospered from the Silk Road trade between the far and near east, and beyond to Europe. The Frick has a history of staging beautiful exhibitions of artistically important ethnographic material, and this show will be a visual delight. It also provides an opportunity to connect the influence of Islamic and Moorish design to interior decoration and decorative arts in the collections at Clayton and The Frick Art Museum.